Lasagna is typically a hearty dish, but our chefs have lightened it up in this delectable version. 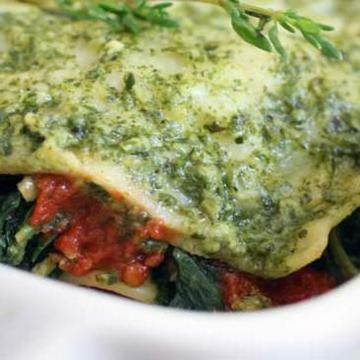 Our handmade lasagna noodles are slathered in homemade tomato sauce, then layered with fresh mushrooms, spinach, two cheeses, and just a touch of cream for an easy-to-prepare and full-flavored lasagna. Prepare from THAWED state for best results.To thaw product, remove from freezer on the morning of the day of use. Product may be refrigerated up to 3 days prior to use. Individual appliance cooking times will vary. Adjust cooking time accordingly. Oven: Preheat oven to 350º F. Remove plastic packaging from paper tray. Cover paper tray with foil. Heat for 15-20 minutes or until warm. Remove foil and heat 5 mins or until lightly browned. Carefully place pasta onto a plate to serve. Microwave: Remove plastic packaging from paper tray. Place paper tray in the microwave for heating. Heat for 3-4 minutes, stirring periodically to ensure even heating. Place eggplant onto a plate to serve. Spinach, Mushroom, Tomato sauce (fresh vine ripened chopped tomatoes, sugar, extra virgin olive oil, sea salt, naturally derived citric acid), Pasta (semolina flour, water, egg), Pesto Sauce (basil, canola oil, olive oil, romano cheese, seasoning), Mozzarella Cheese, Cream, Garlic.